March contents: Our garden friends are waking up..... 'Seat of the pants' gardening!..... How to get ahead with your veg gardening even if it's too wet outside.....Time to sow leeks......My unconventional method of sowing onions and leeks to cheat the weather!.....Dealing with slugs and snails - some organic suggestions......Make sure there's no hiding place for slugs.....How to make an protected propagating area outside if you don't have a greenhouse or polytunnel.....My easy, slug-proof 'Moat Method' to keep slugs out of propagating areas!.....Improving difficult Soil.....Soil Matters!.....My peculiar method of planting potatoes in pots to transplant for outdoor cropping! Three days ago, while tidying up in the polytunnel, I saw my very first hoverflies and ladybirds of 2019, joining the bumblebees which have already been leaving their nests to forage in there whenever there was a mild day over the last few weeks. They are always such a welcome sight and sound - especially now that we are aware that insects are declining so much throughout the world due to pesticide use. We simply can't produce food without them - and as they also provide food for other creatures like birds higher up the food chain - the rest of biodiversity can't survive without them either. They are vitally important - not just to us but to all of that biodiversity which we are only one small part of. Everything is connected - a fact some seem to forget! 'Seat of the Pants' Gardening! After a lovely dry February - the last couple of weeks storms seem to have brought "February fill-dyke" in March! That old colloquial expression shows us how predictable the weather was decades ago. Sadly the increasingly erratic weather we're now experiencing is one of the symptoms of climate change that we're clearly going to have to become accustomed to. It's becoming increasingly obvious that we can no longer rely on the weather progressing as it has done in spring for many centuries. Erratic will become the norm - and February record high temperatures may often be followed by freezing weather and snow in March as we had in 2018! That means that flexiblity, or what I call - 'seat of the pants gardening' - will have to be the norm from now on if we want to get good food crops. Those gardeners who still go by rules that I see so often repeated from old gardening books will be caught out time and again now by the unpredictable weather. The key thing from now on will be to be flexible, experiment and see what works best for you. That's what I've been doing all the time for over the last 30 years since I first really began to notice climate change happening. One of the things that is an absolute no no, is leaving ANY soil uncovered now in this weather - and yet I'm still seeing so many gardeners on social media proudly displaying their pristinely bare, weed-free plots - even if they don't use weedkillers! Bare soil is absolute anathema to Nature, it's bad for soil life and is one of the things contributing to climate change. Some may think that their small garden or allotment plot can't make that much difference - but think about it. All of those small plots add up to a huge expanse countrywide - especially when combined with the ugly, yellow, Roundup/glyphosate-treated farmland I see everywhere throughout the country! A large, bare expanse that is not just polluting groundwater, but also emitting nitrous-oxide from the bare soil - especially where manure or compost is piled onto the soil to prevent weeds germinating and create a nice 'tilth' as it's called - or crumbly soft surface. We should NOT be doing that any more! If you want to get ahead by getting compost or manure out onto beds - then for heaven's sake cover it afterwards! We should be doing ALL we possibly can to minimise greenhouse our gas emissions and pollution, and to preserve precious soil life - as I've been saying for years! Every bit we can do does make a difference, when it's all added up. Anyway - there's nothing that can be done outside yet, and even walking on wet paths damages drainage. The soil here is still so saturated that in many well-trodden places, I'm squelching around in gloupy mud up to my ankles! The route that I use up to feed the pullets and cockerels every day is really treacherous at the moment with all the mud! It's currently impossible to do anything useful in the kitchen garden and my raised beds are islands surrounded by water. As a result - all my efforts for the next week or so will be concentrated on sowing more seeds into modules, so that I have nice, big slug-proof plants hardened off and ready to go when things dry up enough to finally start planting. Although, like you, I'm keen to get out and feel my fingers in the soil, it's still very early days yet, and anything in modules that needs planting will now be potted on before being planted outside. There's no point planting anything just to have it blown out of the ground by gales - it will be safer potted on and growing on quietly in the polytunnel! Not only is the soil far too wet to do anything - but the soil temperature is colder than normal. It would be a complete waste of both time and seed trying to sow anything into it even in the raised beds! A couple of weeks of being covered with clear polythene now will work wonders though in the places where I need to do any early sowings of carrots etc. so I'm not panicking. Over the years I've learnt that it's always a mistake to sow too early - as it often results in seeds just sitting miserably there doing nothing and even perhaps rotting. Any gardening - here at least - will have to be restricted to the polytunnels at the moment - but there's plenty to do in there! After the winter storms over the UK and Ireland - I suspect it's the same for most people! I already have 4 dozen pots of potatoes planted out in the polytunnel which are growing nicely, and as I always do now - I shall be starting all my potatoes for outside in pots too - which I talk about below. Planting them on the traditional day of St Patrick's Day here would mean them sitting in the now icy-cold, saturated ground for quite a long time before they even venture to put their snouts above the ground! I always try to 'think like a plant' when growing anything - and frankly if I was a tender plant like a potato I think I'd sulk for ages planted like that after all the snow we've had! Anyway - mine will be ready at least a month ahead of any tubers direct planted. OK it's a bit more trouble - but I believe it's well worth the small amount of trouble to do this, as it means I reliably get good crops without ever spraying for blight. My peculiar method of planting potatoes in pots to transplant for outdoor cropping! You could plant well chitted early varieties of potatoes in well-drained soil later this month (is there any after this winter?)!! That's if you've had covers on the soil to warm it up. Remember - even the early ones will take at least 10-12 weeks from planting to cropping but you may have to cover with fleece once they're above ground, if frost is forecast. I now grow all my outdoor potatoes by starting them off in pots, as it guarantees that I will miss early blight and it's really useful if the ground is still too wet and cold. It's well worth it, as we've had early blight here at the end of May once or twice over the last few years. Some of the potatoes I grow are extremely rare and hard to replace varieties, so doing this guarantees that I won't lose them. OK - so it may be a bit of a 'faff' starting them off in pots and then planting them out - but no more so than planting out bedding plants - and few people have a problem with that! It just requires a change of mindset that's all! They may occasionally have to be covered with fleece if frost is forecast - but doing this it means that I never have to spray with anything - not even copper based organic fungicides. My soil is heavy clay and copper can build up in soil creating imbalances and causing other problems. I also live in an area which grows a lot of horticultural crops including potatoes - and these are often left in the ground and sometimes not even lifted if it's not financially worth it - with the result that there is more and more early blight around here now. There are also more aggressive new 'super-strains' of potato blight emerging due precisely to this bad practice I believe, which are more resistant to chemical fungicides (as always happens eventually with most chemicals) - so planting early before the weather warms up enough for blight is the only way to avoid it, and absolutely guarantees a crop. As regular readers may know - I'm not keen of the 'Sarpo' varieties, as in my experience here in my local climate, they're really not much more blight-resistant than many of the other varieties I grow. I also happen to think that the Sarpo's are not that tasty either really - so really what's the point? We don't eat tons of potatoes every day as they're very high in carbs -we probably only eat them about twice a week. So despite being able to lower their carb content by about 50% by retrogradation - I would still sooner go to the extra trouble of just starting off my favourite potato varieties in pots just a bit earlier. I grow about 20 different varieties of great-flavoured potatoes each year, some very rare - especially the purple ones. I'll be starting all of them off in pots over the next week or so. People often think that the difference between the earlies, second earlies and maincrops is the time that you plant them - it isn't. The name is what tells you how long it will take them to crop. Early and second early potatoes are the fastest growing and need the shortest time to produce a useful crop, but most will keep just as well as the maincrop varieties. Many become floury and mash well too - particularly Red Duke of York. I also start my maincrops off now too - because they take longer to produce a decent harvest. The old traditional way of planting potatoes straight into cold ground on St. Patrick's day no longer works unless you are prepared to use toxic, expensive and often completely useless sprays against potato blight. That method may have worked many years ago - but our climate and weather have changed and become unpredictable - and so have the fast-evolving strains of blight. Also if ground is saturated it means planting isn't delayed because you're waiting for it to dry out. Using my method - it's unnecessary to use any sprays, organic or otherwise. It's much cheaper and healthier too! So whatever the weather - there is plenty we can do though, to prepare for when the weather changes. March is the serious start of major production in the garden - up to now anything sown indoors has just been the rehearsal! Anything we can do to get ahead now, despite the weather, will save a lot of time and hassle later - and lay the foundations for good crops. Otherwise work starts to pile up - and if it does gardening can become a bit of a stressful chore, if you're trying to grow all your own food like we try to do here. It's meant to be enjoyable as well as productive! The birds are already gearing up for the breeding season though. The sparrows are all chasing each other round and arguing over nesting sites as usual and it's almost impossible to concentrate on any writing, because the starlings are performing their noisy morning ablutions in the gutter just above the back door, accompanied by much splashing, cat calling and 'wolf-whistles'! I can see them from my kitchen table 'desk' beside the kitchen window and they are so entertaining! If you're impatient to start sowing seeds - then do it in modules inside and wait another couple of weeks or so before risking any expensive seed outside. The ground is still far too wet even in the raised beds, which drain far better that vegetable beds on the flat. In the meantime if you haven't got ground covered, then cover it immediately with clear polythene - this will warm the ground up and start it drying out. If you've had ground covered for a few weeks with clear polythene or cloches to warm it up and you live in a warm area - you could start to sow some of the hardier veg. like peas and broad beans outside in a week so - but only if the weather gets milder. 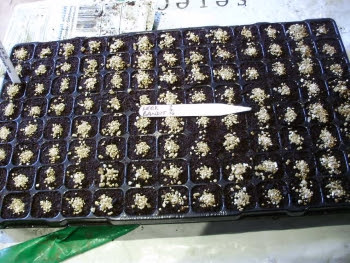 Seeds will germinate far more reliably, you'll lose far less and they'll crop much earlier if you sow them in pots or modules indoors now, then you'll be able to plant them out in a few weeks. That way you won't waste any expensive seed and you'll actually fit more crops into the growing year because you're not wasting 'ground time' waiting for something to warm up enough to grow. At this time of year you can often be waiting 3 weeks for something to germinate outside in cold wet soil and all the while they're sitting there in the ground, they're vulnerable to slugs and rotting because of the conditions. Sowing them in modules on a warm windowsill indoors,or in a sunny cold frame, greenhouse or tunnel now means you can get a head start. They'll germinate quickly, be far healthier and be way ahead of anything sown outside. I actually find it much easier and more reliable to sow most of my veg. in modules now anyway, it saves so much on expensive seed, avoids unnecessary waste from thinning between plants, ensures that plants don't get a check when transplanting and that I don't have any gaps caused by slug damage. In the meantime your plants will be growing away beautifully - in a snug, slug-free environment! The plants will be big enough to withstand the odd slug nibble without being totally wiped out if they're bigger when they're planted. Then when soil conditions allow, you'll be able to plant up beautifully organised, gap-free rows in your veg beds! I love this kind of instant planting - it's so satisfying. Module seed sowing is a also a great method for beginner gardeners. Firstly, one of the great things about planting things out you've raised in modules is that you don't have to spend hours of back-breaking work trying to get the perfect seedbed that some gardening magazines and books recommend! After which either heavy rain can often compact and 'cap' the soil, or more heartbreaking - slugs may eat them overnight before you even noticed they'd germinated! Another reason module sowing is a great method for beginners, is that you can learn to easily recognise clearly each type of seedling. This is much more difficult to do in the open ground - when you've got lots of other weeds etc. germinating. It's also easier to get the right sowing depth, often critical for good germination. And best of all - there's no slugs!! More on that topic later! I'm going to sow my favourite leek Bandit later on today - just as I'm using some of the last of them in the delicious smelling chicken stock (or bone broth as some now call it) that's bubbling away aromatically on the range right now. I was a bit too late sowing them last year - I didn't sow them until the beginning of April and they weren't quite as large as usual. It's surprising the difference three or four weeks makes even this early in the year. Above Bandit is pictured growing in one of the raised beds a couple of years ago, with sugar loaf chicory in background. In the foreground the bed is covered with clear polythene to dry it out and warm it up, as I mentioned earlier. Seed of Bandit is available from several suppliers now. It is a wonderful late variety that's very healthy and disease-resistant, very reliable and great for organic growing. It's also one of the best tasting leeks in my opinion and a really valuable late vegetable when supplies are starting to run short. I usually multi sow it 3-4 seeds per module and then plant them out later, just as they are, if only 3 germinate. At roughly 1ft/30cm spacing - they make a good bunch of 3 which I find a really convenient size to dig up for most meals. If four come up then I carefully detach one and plant them singly for even bigger leeks. I sow them in exactly the same way as I sow my onions - in module trays of peat-free compost - as I describe in the polytunnel section of this month's diary. If you still have leeks in the garden but need to get on with preparing the space they're occupying for different crop - they are very good-natured about being gently lifted with roots as intact as possible and 'heeled-in' - to use the old-fashioned phrase - somewhere else. A shady spot is good as they will then last much longer before starting to produce flower buds later on - so you don't have to use them in too much of a hurry! Just dig a small trench not too deep and put all the leeks together in a short row. No need to space them out too much. Then back-fill the trench with some good soil, water them and they'll be happy there for ages. Be careful not to damage the tops too much when doing this - as they're actually the most nutritious part of the leek - with loads of vitamin A. I can never understand why people cut off the most nutritious and I think delicious bit! I suppose that because they see it done on the ones for sale in supermarkets and other shops - but that's because the tops get so easily damaged and would look very tatty if left on when they're being sold! I think it's really criminal to cut off half the leek and waste it though! My unconventional method of multi-sowing onions and leeks to cheat the weather! Onions from seed are always crop far more successfully than sets, particularly in a bad year - and of course they don't run the risk of bringing in onion white rot disease which sets may sometimes do. That can be even more likely in a wet year - and as it can survive for up to 20 years in the soil, destroying all your onion crops - you really don't want it!. The good news is - it's still not too late to sow them, if you get a move on and sow them now! I've been multi-sowing my onions and leeks for about 35 years now. It saves pricking out and gives me exactly the size onions I want for various different kitchen uses. I have a neat trick up my sleeve for onions - and this one is really worth trying if you are ever delayed when anything sensitive needs planting out from modules. After sowing them in module trays, as soon as the roots start to show through the bottom of the modules - I then sit the module tray into a larger tray of peat-free potting compost. This means that instead of wrapping around and around inside the modules - the roots will immediately start to explore a bit further. I find that despite this involving lifting them gently later in order to plant - I get far fewer 'bolters' this way. I also grow on my leek seedlings leeks this way too. I first thought of this particular trick when I was behind with my work in the garden for some reason (weather, or back problems probably!) so that I couldn't plant out my onions and leeks at the right time. This meant they were in serious danger of becoming starved and root bound - which they hate and is far more likely to cause bolting. What I do is to sit the module tray on top of roughly an inch of fairly loose compost in a large plant tray. I put something like a sheet of newspaper on the bottom first - just to stop the compost falling through, then I put in 2-3cm of organic peat free potting compost - which I water well - and then just sit the module tray on top. This completely avoids the fiddly and time consuming job of having to pot on over 100 modules just for the sake of a couple of weeks or so - and means that the onions, leeks or whatever get absolutely no check at all to their growth. They keep on growing - sending their roots out exploring downwards, happily completely unawares and not being the least bit bothered at all. When I'm finally ready to plant them into the ground - I give them a good watering, very gently ease the tray up out of the compost - take each plug of multi-sown plants out of the module tray and plant as normal. I may get only one or two 'bolters' out of 3-400 onions - so it obviously doesn't bother them in the least! They will usually have put on a couple of centimetres or so of root into the compost underneath in this time - but by easing them very gently out they never even know they've been moved and don't receive any check at all. This was a great success a few years ago, when the weather was so wet that many people's onions were a complete disaster. I had a terrific crop as usual as a result of this trick, most of which ripened well and kept all winter long. Experience is always the best teacher - and like many of the odd things I do, while it may not be not the most conventional way of doing things - it works! Being 'conventional' has never bothered me very much though! I've always felt that 'conventional' was there to be challenged - particularly if it didn't suit my hectic lifestyle, with so many other things to do! Given that we now also have to cope with unpredictable and erratic weather patterns brought on by climate change - it means that we can often be delayed and unable to do jobs when we would like to! The onion trick is something which I've learned works really well from experience. I would otherwise often have to go to a lot of bother and time potting on to avoid plants getting a check - using a lot more compost. Saving time is often as important as saving money for me! If you don't do this, or don't pot them on and just leave them sitting on a hard surface getting starved if their planting is delayed - then the roots will start going round and round inside the modules, becoming very congested. As a result - they will then be far less efficient, the plants will get a check and won't grow as well as they should when you plant them out and may be more likely to 'bolt'. If they're sitting on capillary matting - the effects can be even worse! This is because they will start to root into the matting - the roots then get broken off when you try to lift them up off the matting - and this can cause them to get such a severe shock that many of them will definitely 'bolt' - running straight up to flower instead of producing the nice firm, ripe, long-keeping bulbs that you want. I actually do this every year now with my onions - I like to sow them early to get nice big plants so that I eventually get nice big well-ripened onions! I'm still using the last of last year's 'Golden Bear' and 'Red Baron' onions and they are as firm as ever! It's really worth keeping this trick in mind, when we can't always rely on the weather to behave in the predictable way it always did - and we are all so busy! Although leeks aren't quite as sensitive to being moved as onions - this is still a very useful trick that works really well for them too - especially if you have to go away at short notice or are held up in some other way. If you have time beforehand you could row them out in a small patch of a veg. bed if they are large enough instead of doing this and plant them out as usual later - but if they're still small that's risky as they're far more vulnerable to slugs! This way success is guaranteed! Following the same advice given in old gardening manuals just because that's how it was always done is rather outdated now. Our climate is definitely changing and we'd better learn to be adaptable and think laterally. That's why I call it 'seat of the pants' gardening! If you've had a lot of slug problems in the past - then putting some black polythene cover on beds is a useful thing to do right now, if you haven't done that already. As the beds start to warm up a bit slugs will collect just under the surface rather than going deeper underground. The dark fools them into thinking they're safely out of sight and you can just peel back the polythene and dispose of them in whatever way you like - but just make sure they're truly dead! What you do after collecting slugs is up to you. My favourite way is to snip them in half with some long sharp scissors - or feed them to my hens who love them - although some people are squeamish about that. It really freaks them out - but don't forget slugs are food for many birds and other wildlife who are now absolutely desperate for food - so steel yourself and just think about them! Odd how people can be so squeamish about doing something which is a far kinder death and far less likely to kill something else than using poisonous slug pellets! Out of sight out of mind I suppose! If slugs and snails are just snipped in half without being poisoned - it means that hungry wildlife can still eat them with absolutely no danger of being poisoned. And of course chopping them up makes a much more convenient mouthful for a hungry blackbird or thrush! I find it also helps to think about the crops you may lose if you don't do that! Then you'll find that using the scissors becomes much easier! Birds don't seem to like the really huge slugs - they prefer them once I've cut them in half with my sharp scissors (dainty appetites obviously!) - and I don't mind obliging in the least! Either that or I give them to the hens who have great fun with the really big ones - playing a sort of 'slug tag' - running around with a big one dangling in their beaks while being chased by all the others before finally gulping it down! (more protein for the eggs!!) Cutting them up is not only probably kinder to them - a fast decapitation rather than a slow death from poisoning - but it's also much the most wildlife friendly and environmentally sound way of dealing with slugs. I know some people area a bit squeamish about slug snipping - but believe me - it 's a lot easier after you've lost a few expensive rows of carrots or lettuces to the little blighters! They say committing murder is always easier after the first time! Please don't be tempted to use poisonous slug pellets - even organic ones can poison some creatures - especially some greedy pets. Slug pellets don't just potentially poison wildlife, they also pollute our groundwater - so I'm delighted to hear they will be banned soon outdoors! Make sure there's no Hiding Place for slugs! Hiding a lettuce leaf under a slate is a good way to trap unwary slugs!I tend to use a combination of different approaches for dealing with slugs and it works well for me. As the garden warms up, the weeds start to grow, and keeping them down in and around vegetable beds will prevent slugs from hiding there and coming out at night to wipe out your crops. Keeping any grass paths next to veg beds mown really tight is key too, as it also allows birds to see slugs and snails more easily and pick them off and it stops the paths being a convenient hiding place! Occasionally I might use beer traps, but they don't always work. They can be useful if you have a big problem, which you will do if you allow your plot to become weedy and overgrown, or may have if you're starting on a new plot. I find if you get rid of slugs my way, there's generally very few left after that. Pieces of slate or well-anchored small bits of black polythene placed along rows and at the edges is very good too - especially along rows or in between vulnerable plants. Slugs will hide under the slates thinking they're safe! Not so! You can just have a quick look underneath and scrape them off into a container every so often. Ducks are very partial to slugs too. I used to keep a lot of Khaki Campbells and rare breed ducks like Silver Appleyards here many years ago, before the fox problem became too bad around here. Ducks hate being shut up and they used to patrol happily around the vegetable garden hunting for slugs - which wasn't a problem as long as juicy duck treats like lettuces were well covered! If you moved a bit of black polythene in the vegetable garden back in those days - you'd nearly be killed in the rush - with quacking ducks all piling in from all directions with great gusto, to be the first to grab them and greedily guzzle them up! They were such sociable, intelligent creatures and used to come if I called their names - I do miss them! With ground far too wet to do anything in veg. beds - organising a small propagating area outside is a good job for a sunny day. Even if you have a tunnel or greenhouse - it's always useful when things get busy to have an extra area where you can stand things that are 'hardening off'. It needs to be in a well lit, sheltered but not shady area - where it won't be too sunny later on. As a bench - you could use an old table or a even couple of planks resting on some blocks, so that your seed trays are off the ground. This prevents slugs from reaching them. If you don't have a greenhouse or tunnel this is a really good slug proof way to raise seedlings outside - which you can further improve by the addition of a cheap cold frame, cloche or home-made polythene frame to give seedlings a little extra warmth and also protection from heavy rain and wind. It's also a great place to 'harden off' safely any seedlings raised indoors in modules. Module sowing at home is also a great way to get your plants going if you have an allotment, which may not be near enough to pop down to every so often to check on slugs etc. It's obviously much easier to keep an eye on seedlings if they're just outside your back door - and a few modules or seed trays really don't really take up that much room. As I've said many times before - it's not just easier to protect them from slugs if your propagation area is raised - it also means that they're at a reasonable height to tend, which is great relief for a bad back! Then you'll have nice big plants ready to plant out that are big enough to withstand the odd nibble from a slug or two without losing them altogether. My easy slug-proof 'Moat Method' to keep slugs out of propagation areas! Over 40 years ago, before I had a tunnel or greenhouse, I came up with a brilliant way to prevent slugs and snails from getting into my seedlings! I had a home-made cold frame placed on an old metal legged table and after much thought I invented what I called my 'Moat Method'! This involved putting each table leg sitting in a big metal can of water - that way, there was absolutely no way for the slugs to even be able to climb up there! If your table is wooden - then just cut off the bottoms of four plastic bottles and sit the table legs in those so that they stay dry while sitting in the water and won't rot! Simple! Slugs can do a lot things - but the one thing they can't do is swim!! (They do try bungee-jumping though! Occasionally dangerously suspending themselves on a long thread of mucous from the roof of the tunnel - not nice when you walk into them unsuspectingly!) Just make sure your table, seed trays pots etc. are completely slug-free to start with and then you won't have a problem! A favourite place for them to hide is between the inside of seed trays and the module inserts, or under pots. Keep an eye out for their 'give away' silver slime trails, even really tiny slugs can decimate a tray of precious seedlings like lettuce or carrots very quickly, so check under seed trays etc. from time to time. 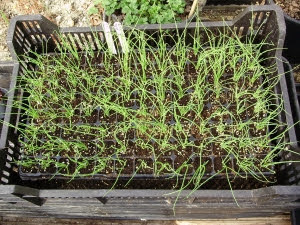 It's also a good idea to cover brassica or carrot seedlings with something like Enviromesh to keep cabbage root fly and carrot fly out from now on as the weather warms up, and old freezer baskets or chicken wire are useful for keeping sparrows and some other small birds out - who sometimes seem to enjoy scratching up tiny seedlings just for the sheer hell of it! If you have a pigeon or pheasant problem having netting over them prevents them getting into them too. Mouse traps are also essential here too - I lose more to mice than anything since I don't have an effective cat! They've all my broad beans this year even though they were already 2 inches high! My 'moat method' works perfectly for vine weevils too if you have something really precious you don't want to lose like auriculas which are very prone to vine weevil damage. After ensuring that there are no vine weevil grubs in their compost - just sit their pots on something raised above a saucer of water. The female vine weevil bugs won't be able to crawl up into the plant pot as they usually would - because they can't swim either! Propagating in modules in this way means you can deal with any slug or pest problems in your vegetable beds at the same time as raising your plants elsewhere. This gives you the absolute peace of mind of knowing that you'll have really nice strong plants to plant out in a few weeks time with no losses to slugs, even if you haven't managed to get every last one by then! I sometimes feel the garden is under siege from all sides - but there's always a clever organic way of defeating everything with a little thought and effort - and it's so much more satisfying using your wit, rather than harmful chemicals! I really love what I call 'instant gratification' of module raised plants too - there's nothing as satisfying as looking at really well-grown plants, planted neatly spaced out, in rows without gaps in a well prepared bed. That is except eating them - naturally! Neatly ordered, well-grown veg. are every bit as beautiful as any herbaceous border! I've already covered my particular method of sowing seeds into modules in February's veg. garden and polytunnel diaries - and you can find details of all the veg. that it's possible to sow now in my 'What to sow now' section for March. Over the next week or so - whenever it's dry - I'll be uncovering the empty beds in my kitchen garden and, letting the air in to dry them out even more. Doing that also lets the birds clear pests like millipedes, wood lice etc. They'll be grateful for anything they can find as food is very scarce right now. Cover the beds up again before any rain is forecast - and if the cover excludes light - like black polythene - this will also help to stop weeds seeds germinating. So no need to panic if the soil's too wet to work. If you can see plenty of weed seeds germinating, when the soil outside has dried up a bit - that will show the soil should be warm enough to sow the hardier things outside - no need for expensive soil thermometers - Nature shows you exactly when the soil's warmed up enough for growth. I'm often asked what is the best way to improve soil - and I always say - grow things in it! I know that sounds a bit like a daft or clever reply - but no one starts off with the perfect soil (if there is such a thing - except from an individual plant's perspective). That is unless they've inherited an old garden that's been worked organically for countless years. I think you can turn even a 'builder-ruined' soil into something reasonable within about three years - I've done it! The proof of the pudding is good, healthy crops. Just keep adding compost, well rotted manure, mulching (which also excludes light between rows and keeps weeds down) and using green manures. 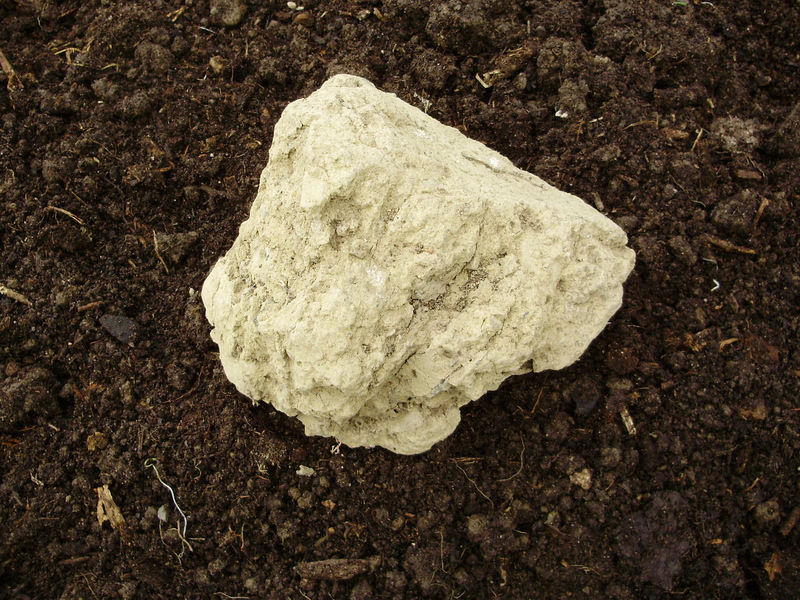 You will be amazed how quickly you'll achieve a really good soil structure. Calcified seaweed and seaweed meal also help too, as they really get the biological activity going in poor, very compacted soil - encouraging all the micro-life including worms, which also help to break it down and aerate it. This is the reason why 'double digging' is so bad for soil - because there's a vast army of little workers beavering away permanently just underneath the surface of the soil - and each one has it's own designated level. They don't want to be buried so deep that it takes them years to fight their way back to the surface where they can do the specific job Nature evolved them to do, in those particular top few centimetres! It would be the human equivalent of a serious earthquake to us! These microorganisms have developed over billions of years to live together symbiotically and do their specific job just in the very top few centimetres of soil - so don't make life even harder for them. And remember - the better you make life for them, the more efficient they are, and the harder they'll work for you! Good organic gardening grows the soil - it's the living population in that soil that really grows the plants! Even if your soil is really rubbish and full of concrete-like clods - as it often is in the so-called 'garden' of a newly built house - there is hope after builders! Pictured here on top of my soil now is a lump of the 'soil' I started off with 8 years ago in my new polytunnels! It makes a stark contrast with what the soil looks like now! If your soil looks like that - you can raise your plants in modules, then plant them out and they'll be fine. If it's seriously bad the first year, you may have to even make little pockets of compost in the soil to plant into as I mentioned last month - but after that the plants will grow on afterwards quite happily, the roots finding their own way around the clods or even breaking them up, as long as you keep the soil moist. Plants want to grow - as anyone who has ever left a forgotten few spuds at the back of an untidy veg cupboard will know! I'm sure you probably tidy yours out more often than I do mine, so perhaps you haven't experienced that interesting phenomenon!! I'm afraid once it gets to this time of year, any thoughts of 'spring cleaning' inside the house completely disappear off my agenda (if they were ever on it in the first place)! That's after I've cleared out any odd packets of nuts etc. that escaped my notice at the back of the cupboard and fed them to the hungry birds!! Chemical additives or gimmicky 'quick fixes' may seem an attractive idea and possibly produce impressive results for a very short time - but they don't feed all the soil life that works together to ultimately produce the humus that builds a healthy, carbon-fixing soil. They may not produce healthy food with a properly balanced range of nutrients for us to eat either. There is a growing body of strong scientific evidence showing that by emphasizing one particular nutrient in soil - you can seriously unbalance others, and this can even mean that our bodies absorb the nutrients from that particular crop less well than Nature intended. It may be an unpopular thing to say - but Nature still knows best when it comes to growing food - and it is extremely arrogant of humans to assume anything else! There is still so much we don't know about how everything in the soil works symbiotically - and yet in many parts of the world we have already virtually destroyed it completely! The best way to improve any soil and encourage worms to help you too is to mulch, mulch and mulch again! You can't go wrong with that. Mulching with whatever you have to exclude light also helps to keep weeds down and keeps moisture in - especially important if we get a long drought as we did in the summer of 2018. Grass clippings from untreated lawns are great between potato rows, and the potatoes also enjoy the acidifying effect, which discourages potato scab, often caused by excess lime, or chlorosis (mineral unavailability). This is something which can happen on high pH (limey) soils - especially encouraged by gardeners following the 'rule-books' and adding lime annually to soils! In the past I used grass clippings on top of layers of damp newspaper, but the birds just loved scratching them all aside to find worms, and the garden started to resemble the local tip! Now I just use the grass clippings on their own, keeping them a little away from the stems as the nitrogen in them when they're freshly cut can burn soft young growth. Watering any mulches immediately, as soon as you you've put them down prevents this happening. I also use comfrey leaves in the same way, as well as compost. If you're mulching with anything, always make sure that ground is damp first. Not usually a problem in our spring weather! 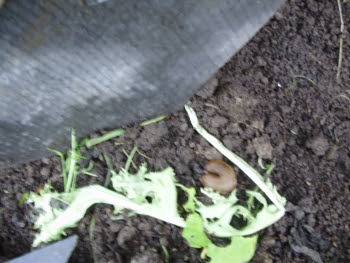 Even a black polythene mulch is better than nothing, but tends to harbour slugs. Although then it's easier to lift it and pick them off from where they're hiding underneath! For those of you who may be new readers - this blog isn't just about ways to garden organically. It's also about sharing with you many practical tips for making food healthier and also cheaper, which I've learnt over the 40 plus years that I've been growing for my family! I really enjoy sharing my original ideas and 40 years experience of growing and cooking my own organic food with you. It's most satisfying and naturally also very complimentary if others find "inspiration" in my work......but if you do happen to copy any of my material, or repeat it in any way online - I would appreciate it very much if you would please mention that it originally came from me, as it's the result of many years of hard work and hard-won experience. Thank you!